IELTS is the International English Language Testing System. It tests your ability to communicate in English. IELTS results are used by organizations to assess your language skills when you want to study, work or live in an English-speaking country. IELTS tests are held in over 500 centres with tests up to four times a month. IELTS respects international diversity and is fair to anyone who sits the test, regardless of nationality. You can choose from two types of IELTS test: Academic or General Training, depending on whether you want to study, work or migrate. Both modules are made up of four parts - Listening, Reading, Writing and Speaking. 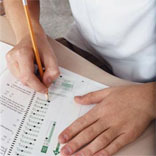 IELTS results are graded on the unique IELTS 9-band scale. To help you prepare, IELTS provides samples and practice tests. The test covers the full range of ability from non-user to expert user. You are not limited in how many times you can sit the test. You can trust the quality and security of IELTS because it is owned and managed by three reputable, international organizations: British Council, IDP: IELTS Australia and the University of Cambridge ESOL Examinations (Cambridge ESOL). To register for an IELTS test, follow these six simple steps. Print out the IELTS Application Form or ask your test centre for a copy. Read the information for candidates, terms and conditions, complete the form and sign it. Please make sure you have a valid postal address and use the same name as on your passport. Take your application into your IELTS test centre with your money. If you send it by mail, please talk to your centre about the method of payment. Once you have registered, the test centre will confirm your IELTS test date, time and venue. Please note the Speaking test can be up to 7 days before or after the test date. To help you in IELTS preparation, IELTS has a range of materials. IELTS has Official Practice Materials 2007 to help you understand the format of the test and the types of questions. The book has sample questions for each part of the test, including a CD for Listening. You can practice your skills and then use the answers and Examiner comments to help you further improve. The IELTS Official Practice Materials 2007 is the only IELTS training book endorsed by the IELTS partners. You can buy a copy from your nearest test centre or order online. It will ensure you do the test to the best of your ability.